In his long and distinguished career in BBC News, spanning over 30 years, it is perhaps ironic that Michael Buerk is indelibly linked with just one story. When he and cameraman Mohammed Amin first brought the plight of millions of starving Ethiopians to British screens in 1984, he needed to say little in order to convey the desperation and suffering. His cool, dispassionate style was later to be praised by his BBC colleague, John Humphrys. "Would Michael Buerk's reports have been more effective if he had been holding back the tears as he delivered the commentary?" he asked the Guardian newspaper in a recent interview. "No... He wrote a spare and powerful commentary and left it to us to form our own judgement." The reports were watched in horror by singer Bob Geldof. He bullied and cajoled a host of pop stars into gathering to form Live Aid, and persuaded millions of people to part with their money to help the starving. 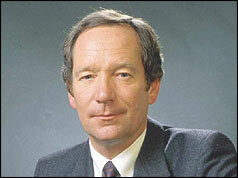 Michael Buerk came to the BBC after an early career in newspapers, including the Daily Mail. He spent over 20 years as a foreign correspondent, and looks back on those years as among the best of his career. "I still think being a foreign correspondent is the best job there is, because of the sense of witnessing history," he told the Times newspaper. He reported from more than 50 countries, including a four-year stint in South Africa, until he was asked to leave the country by the then government because of his uncompromising reporting. In 1991 he was airlifted out of Addis Ababa after a munitions dump exploded, killing his Kenyan sound recordist, John Mathai, and injuring Mohammed Amin, the cameraman who had accompanied him to Ethiopia in 1984. By this time, he was turning his hand to presenting, and had become one of the main anchors for the BBC Nine O'Clock News. He also began presenting non-news programmes such as BBC1's 999, and on BBC Radio 4, the ethical debating programme, The Moral Maze, and interview series The Choice. He has crossed swords with his employers on occasion, expressing his disappointment at the decision to move the Nine O'Clock News to its present slot an hour later. He has also openly criticised the "pressure to deliver" on today's news reporters. He announced his retirement from news presenting at the end of 2002, although he will continue presenting other programmes and making one-off films. Michael Buerk's harrowing report from Ethiopia describes "a biblical famine"
It's the little things that you notice in this cacophony of misery... The whole thing is emotionally overwhelming. You take some sort of refuge in the mechanics of the job that you do... but there are limits, and it got very close to the limit of being able to function in the midst of all that, because you feel an overwhelming sense of inadequacy. The only Europeans who were there were aid workers, and you weren't, you were just a journalist, and at that particular moment I couldn't think of a more useless occupation.